When you use Verts Instancing, it seems that Blender creates more objects than it should. Parent it to the first Cube. With the first Cube selected, go in the 'Instancing' Panel of the' Object' Tab in the 'Properties' Area. Select 'Verts' option. 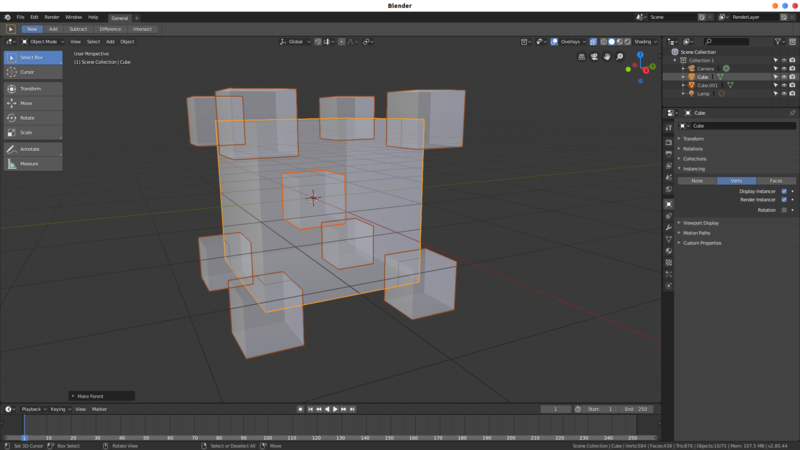 You should normally now have 12 Objects, 80 Verts and 60 Faces in your 3D View. However, the Polycount displays 75 objects, 584 Verts and 438 Faces. rB9d63b0d539b4: Fix T61469: wrong object statistics when using instances. Brecht Van Lommel (brecht) added a commit: rB9d63b0d539b4: Fix T61469: wrong object statistics when using instances..